About half of this week's new entries concern United Airlines Flight 93. The airline's operations centre sent a message to the plane's co-pilot some minutes before the hijacking, but received no reply; it also notified flights of a crash at the WTC around 9:03 but did not send a warning about possible hijackings at this time. The airline's dispatchers were asked to warn flights at 9:21, the same time Flight 93 sent a routine message to one of the dispatchers. A couple of minutes later, it checked in with Cleveland air traffic control; the pilots then sent their last last message at 9:27. 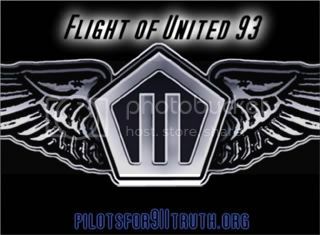 Government secrecy, conflicting information and improper investigations brings you the third Chapter of the Pandora's Black Box series - Flight Of United 93. Based on Flight Data Recorder information provided by the National Transportation Safety Board (NTSB), Pilots For 9/11 Truth analyzes the conflicts with the government story regarding the events surrounding United Flight 93 following the flight in real time as it departed Newark enroute to San Francisco, CA on September 11, 2001. Analysis includes NTSB animation, witnesses, reported impact, parts discovered and more. Please take a moment to vote for "United 93" as the Worst Movie of 2006 at IMDB.com. You must be registered at IMDB to vote. You can vote it the "worst" of several categories. Don't be shy. Send a message. We will not accept the mythology of 9/11 as documentary entertainment. Currently, The DaVinci Code leads the voting with only 462 votes. I'm sure we can do better than that. NEW YORK (Reuters) - "United 93", a tense drama focussing on one of the hijacked planes used in the September 11 attacks, won the best picture prize on Monday in the New York Film Critics Circle Awards.